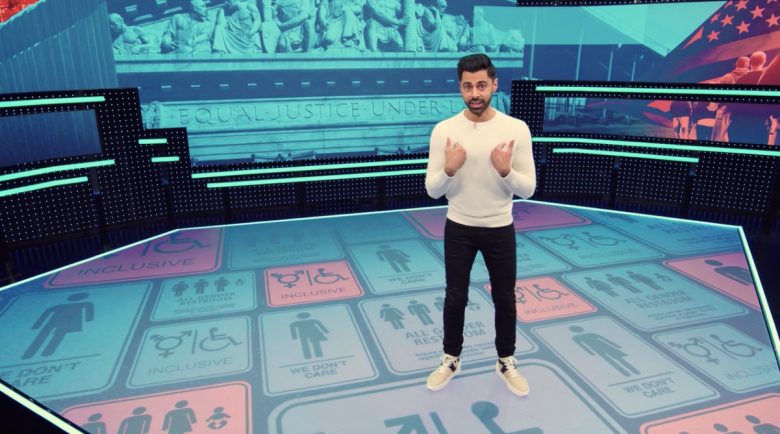 If you have seen the Netflix show Patriot Act with Hasan Minhaj, you might have noticed the spectacular eye-popping set that is used for the show. And if you are a curious geek like me, you might want to know about the people responsible for building and operating it. The show is a comedy vehicle for the Daily Show correspondent, and mixes a great deal of pop culture and news references in the goal of tackling a single topic each week. Minhaj is on stage for almost all of each episode. You first notice the stunning visual design of the set because it is the set. Minhaj stands on an LED floor that changes in synch with the screens that form the background of the show. This isn’t your grandfather’s PowerPoint, baby: images zoom in and out and video animations roll across the screens. There are catchy infographics that rotate and fade in, and all the other tricks that we have come to expect in the average Marvel or Pixar movie. Only it is a TV talk show. I think it is pure genius. After you watch this show, every other talk show looks dull as dishwater by comparison. My interest here is also personal: as a professional speaker, what the team that produces this show is doing is showing how we can use technology to truly immerse an audience into a performance. It is as big a sea change as when I swapped out my black-only “foils” for color PowerPoint for my speeches. Only better. I interviewed two of the folks that are responsible for the show. Granted, any show is a collaboration of many, many people, including a dozen different animators, designers, and pre-visualization specialists, not to mention all the writers and other usual TV production folks. If you aren’t familiar with pre-viz, as it is called, this is an interesting part of the entertainment universe. As more filming has gone digital, pre-viz folks become very important, because they give directors the ability to see exactly how a scene will look like in its final form before anyone has touched a camera. Think of it like a virtual scene — you can manipulate all sorts of stuff without having to actually build it in real life. I’ll get to why this is important in a moment. I first spoke to Greg Bloxham, who is the computer operator for the show. That title doesn’t really do his role justice, which is critical to the whole operation. I then exchanged emails with Marc Janowitz, who is the Production and Lighting Designer for the show. Both guys have developed the look and feel and chose the technologies that are used each week. If you are a fan of Minhaj’s standup, you probably have seen his Netflix special, Homecoming King. Janowitz was involved in that production, which really was a beta test of what the TV series is doing. “Patriot Act is more like a deep dive into a particular subject that requires intense visual aids to help support the thesis. We had this desire to delve into a style of visual narrative that blends imagery, form and structure and helps to immerse the audiences in the material,” said Janowitz. And as I said earlier, the studio audience is immersed. “A big part of the design impetus for this show was to capture the energy of a live performance with an audience,” he said. Basically, they have turned the tired model of anchorperson-behind-a-desk on its head. Bloxham spends two days a week on each episode, one day for basic rehearsals, the next day for more detailed rehearsals and then the live-to-tape final run through. He has had a long career in lighting and media design, starting with the Oprah show and then moving into doing live music events and other extravaganzas. “This was a field that was pretty obscure a few years ago, but is now getting to be more common,” he told me. If you remember Oprah, she had video screens around her studio, but not to the extent that Minhaj uses on his show, and certainly not to the extent that they are run in real time. One of the reasons for the look and feel of the show has to do with Minhaj’s personal preferences. He is very involved in the pre-viz process, naturally, and also has a lot of opinions in how the final shows appear. “It is nice that he is so deeply involved,” Bloxham told me. The show takes a lot of collaborative work, because as you might imagine having such powerful tech means that writers can change things pretty much up to the last minute. He takes the content from the animators and then puts it all together so that they can run the visuals in real time during the actual performance. If you look carefully at any of the episodes, you’ll see the set lighting change colors in synch with what is shown on the video screens. “You can literally program things to move in time with each beat,” he said. Actually they have two media servers, one for backup. “Tech always has a risk, and this way I can switch over to the backup system with just a push of a button,” said Bloxham. He has a control console board that is custom built, and includes the lighting controls as well. Given the number of people involved in producing the show, paying for a second server is a wise investment. So check out Patriot Act on Netflix and let me know what you think. I think years from now we will be talking about its influence, just as we wax on about The Sopranos today.